Cedar Grove swept the Region 5-3A boys’ and girls’ track championships last weekend as part of six region titles that were brought home to DeKalb County. The Lady Saints outdueled Westminster 163-158 while qualifying nine track and field individuals and 3 relay teams for Saturday’s Class 3A State Sectional B at Bremen High School. Four Cedar Grove participants brought home gold medals including Roben Heard (100m dash, 12.68), Chanlor McGhee (100m hurdles, 15.48), Antania Swain (discus, 107-05.00) and the 4×100 meter relay team of Hadiya Barnwell, Bobbi Turner, Macaya Johnson and Chanlor McGhee with a time of 50.96. Heard (200m dash), McGhee (300m hurdles), 4×400 meter relay, Hadiya Barnwell (triple jump), Mynaisha Mitchell (high jump) and Swain (shot put) brought home silver medals from the region meet. Stone Mountain’s Toni Pellington won the high jump gold (5-00.00) and silver in the long jump (17-09.50). Towers qualified four individuals and one relay team while Redan quailed two individuals and two relay squads for sectionals. Stone Mountain and McNair both qualified one individual for the sectional. The three-time defending Class 3A champion Saints put 10 individuals and three relay teams into the state sectional taking an 180-168 victory over Westminster. Israel Spivey and Jadon Haselwood collected two gold medals each out of the seven collected by the Saints. Spivey won both the 100m dash (10.86) and 200m dash (21.74) while edging out teammate Kortney Cox in both events. Haselwood grabbed the gold in the 110m hurdles (14.87) and 300m hurdles (41.25) with wins over teammate Dimitri Cooper in both events. Spivey, Cox, Cooper and Terrence Lewin teamed up to win the 4x100m relay (42.81) while Cooper and Lewin joined Justin Lane and Deanthony Moore to win gold in the 4x500m relay (3:22.80). Keshun Byrd had a pretty good meet in his own right as he won the triple jump (45-10.50) and silver in the long jump (22-03.25). Lewin was second in the 400m dash (50.15) and Isaiah Ratcliff was second in the discus (119-02.00). Towers qualified five individuals and one relay team led by Stephen Harris with a win in the shot put (48-06.50). Redan put three individuals and two relay team through to the sectionals while McNair qualified three individuals and Stone Mountain one. The Miller Grove girls and Arabia Mountain boys came away with the Region 5-5A track titles at Godfrey Stadium. The Lady Wolverines captured 10 gold medals on the way to a 195-140 victory over Arabia Mountain and qualified 15 individuals and three relay teams for the Class 5A Sectional B at Eagle’s Landing High School on Saturday. Tacari Demery was one of three Lady Wolverines to bring home two individual gold medals with a sweep of the 100m (11.96) and the 200m (24.64) dashes. Emoni Coleman joined Demery by taking the 800m (2:23.51) and 1600m (5:32.18) run gold medals. Marguerite McGill joined in on the two gold medal fun by winning both the shot put (34:06.00) and discus (105.04.00) events. Zariah Kitchens won the 400m dash (58.55) and Kayla Williams captured the triple jump (34-10.50) to round the individual gold medals for Miller Grove. The 4x100m (47.79) and 4x400m (3:58.73) relay teams also placed first. Samaria Allen won the 300m hurdles (46.59) and Patra Williams leapt to the high jump (5-02.00) title to lead Arabia Mountain to the second place finish. Arabia Mountain qualified 10 individuals and four relay teams for the sectional. Chamblee qualified for sectional in five individual events led by Beining Xiao’s victory in the 3200m run (12:06.87), Simone Perez’s gold in the 100m hurdles (17.35) and Khiara White’s win in the long jump (18-05.50). The Lady Bulldogs were third overall with 92 points. Southwest DeKalb qualified four individuals and one relay team for the sectional with Clarkston adding two individuals and Columbia one. The Arabia Mountain Rams outdistanced Southwest DeKalb 145-101 to win the boys’ title with 10 individual sectional qualifiers and one relay team. Jordan Barrow picked up two gold medals with a sweep of the 100m (10.90) and 200m (22.13) dashes. A win by the 4x100m relay team (42.34), Zion Greer in the high jump (6-00.00) and Kerrell Hurt in the triple jump (42-05.00) also aided the region title. 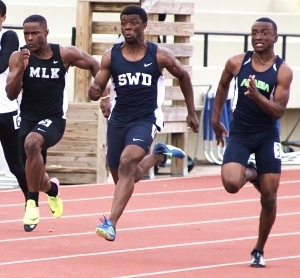 Southwest DeKalb grabbed gold in the 300m hurdles by Jabez Long (41.12), Tommy Wright in the long jump (22-08.75) and Nicholas Edwards in the shot put (50-05.25) and discus (172-07.00) to take second just four points ahead of Miller Grove (97). The Panthers qualified 7 individuals and two relay teams for the sectional. Miller Grove’s productive meet including gold medals by Chuck Shawn Collins in the 400m dash (49.51), Walik Robinson in the 110m hurdles (14.79) and the 4x400m relay team (3:22.18). The Wolverines qualified six individuals and three relay teams for the sectional. Clarkston put together a strong region meet with three gold medals and a fourth place finish with 91 points. Ngabo Daniel won two gold by being victorious in both the 1600m (4:42.91) and 3200m (10:16.86) runs. Tyrell Simmons was the pole vault winner (7-06.00) to complete the Angora gold medal haul. Nine Angoras qualified for the sectional. Chamblee picked up one gold with its fifth place finish (82) as Rasheed Cobb ran to the 800m (2:05.90) title. The Bulldogs qualified six individuals for the sectional. Lithonia qualified three individuals and two relay teams for the sectional and Columbia put one individual through. 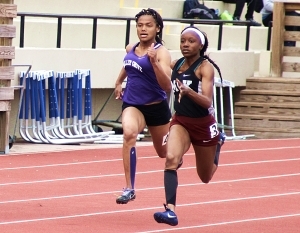 Stephenson and Martin Luther King Jr. split the Region 4-6A titles as 46 individuals and 10 relay teams qualified for the Class 6A State Sectional B at Atlanta’s Lakewood Stadium on Saturday. The Lady Jaguars had just two gold medal winners, but also added six silver and four bronze medal finishes to get past the Lady Lions 142-107. Deanna Rawling won the 1600m run (5:56.72) and Simone Harper won the 100m hurdles (14.96) to lead Stephenson which qualified eight individuals and two relay teams for sectional. The Lady Lions put together five gold medal finishes led by Kayla Hunt’s wins in the 100m (11.99) and 200m (24.49) dashes. Jaili Green added a victory in the 300m hurdles (45.84) and a sweep of the 4x100m (47.36) and 4x400m (3:57.21) relays were big for King. Nine individuals and two relay teams qualified for the sectional. Tucker qualified one individual and two relay teams for the state sectional. The Lions used a sweep of the 100m (10.83) and 200m (21.68) dashes by Jhivon Wilson and Coleman White’s high jump (6-02.00) victory to pull out an 11.5 point (140-128.50) win over Stephenson for the boys’ title. King qualified five individuals and two relay teams for the state sectional. A sweep of the 4x100m (42.13) and 4x400m (3:22.21) relays solidified Stephenson’s second place finish. The Jaguars also got gold medal performances from Bradley Favors in the 400m dash (48.40) and Previs Seldon in the discus (145-03.00). Stephenson put 10 individuals into the state sectional and two relay teams. Tucker qualified seven individuals for the state sectional led by double gold medal winner Mohammed Koko in the 800m (2:00.65) and 1600m (4:47.69) runs and Justin Mitchell in the triple jump (43-03.50). Dunwoody qualified five girls and one boy for the sectional at Lakewood out of Region 7-6A. Ariel Lawrence won the long jump (18-01.50) to lead the Lady Wildcats. Ben Bass was third in the pole vault (10-00.00) to top the Wildcats. Druid Hills picked up 10 individual qualifiers and three relay teams for the Class 4A Sectional A at Blessed Trinity with their performances at the Region 4-4A Track Championships. The Lady Devils had six qualifiers led by Genevieive Ferrara’s wins in the 800m (2:27.39) and 3200m (12:26.24) runs. The 4x100m relay and 4x400m relay teams qualified for the sectional. The Devils put four individuals into the sectional led by Carter Rathur’s victory in the 3200m run (10:34.30) and silver medal in the 1600m run (4:45.39). Lakeside advance three girls and three boys to the Class 7A Sectional B at Mill Creek High School on Saturday behind their Region 7-7A performances last week. The Lady Vikings got a silver and bronze medal from Chanel Bishop in the 200m (26.05) and 100m (12.82) dashes, respectively. Emma Hanson in the 3200m run (12:05.45) and Nyla Fuqua in the 100m hurdles (16.87) added to the 52 points total good for fifth overall in the team standings. The Vikings top finisher was Mikias Mekonen in the 3200m run (9:54.42).